The talk covered the whole period of railway development and the impact on the villages affected by the routes taken. Sharnbrook Station was important to the local merchants and the Colworth estate. The initial timetables show how trains from Sharnbrook travelled to London via Hitchin. Subsequently they developed what is the current main line via Ampthill and Luton. The impact on employment was significant and we have many examples of labourers from the village being employed by the railway companies. 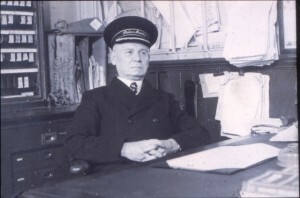 Mr Dowdeswell was one of the Station Masters. 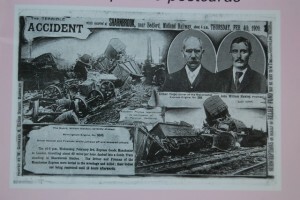 One of the major railway accidents occurred in Sharnbrook in 1909. A postcard was created as a way of fundraising for the dependents of those who lost their lives.